When Google was launched years back, its sole intention was to drive people closer to the information they need. Over the last 13 years, that is exactly what Google has been doing! Also, the search engine strives to make it bigger and better each day. This is what leads us to the new, big Google launch! A new initiative, going by the name of Google Jobs, is all set to hit the floors to get American job seekers a chance to explore their career. This particular initiative collects and collates information about millions of job postings across the globe to bridge the gap between employers and job seekers. Google takes it up as a challenge to get the right kinds of jobs for the right people. In order words, the world’s largest search engine will be mapping the jobs available to the appropriate candidates. While Google has taken up many difficult search requests in the past, this will be another medal to add to its achievements! In spite of there being several employment websites across the globe, 46% of the employers say that they are not getting the aptest talent for their job openings or positions. It is true that there are a lot of job seekers at present, but there seems to be a bit of disconnection between the two spheres: the employers and the potential employees. This is what Google wants to do away with and have a smooth and consistent job search process. But there is a slight difference about Google’s operations in this case. 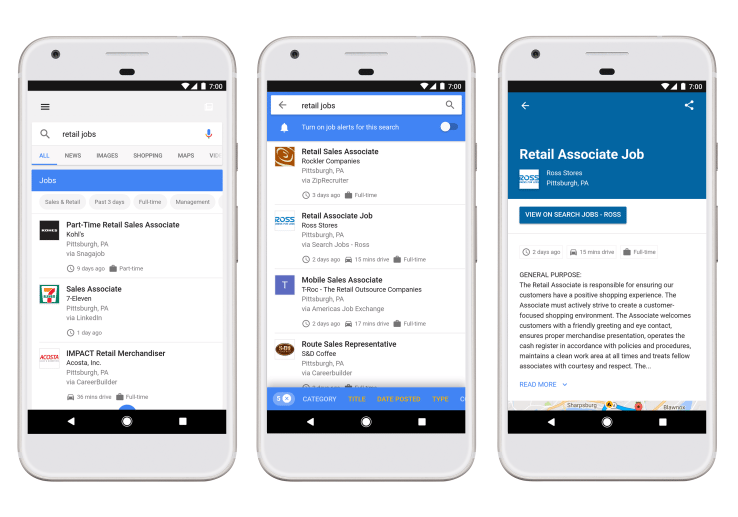 In the quest to provide job searches to potential candidates, Google is actually not taking on the traditional or well-established employment sites. Instead, it is partnering with them in order to bring out the best results for the users! So, names like Glassdoor, Monster, CareerBuilder will not be competitors to Google in this regard; instead, they will be working simultaneously with the search engine to reach out to more people. One really attractive feature of Google Jobs is its efficient filtering system. For instance, when you search for a particular kind of a job, any search engine is expected to give you a number of results for you to work with. But when it comes to Google Jobs, you will be able to filter the search results based on the location, category, posting date, types of part-time or full-time jobs, even availability of transportation. With these filters on, you would be able to narrow down your search to your exact requirement. In fact, information like commute time from your location would also be displayed on the site. It would be rather interesting to see how well Google caters to the job-seeking audience! So, if you’re looking for a job? Just GOOGLE it!